Upon chatting with Feizal Fakier, it’s clear that he’s proud to be here at Market with Pure Palate Organic. In fact, it’s right where he’s meant to be. His passion for the organic, raw, and fermented dairy goods he brings to Market each week is palpable, and his knowledge about the products is plentiful. 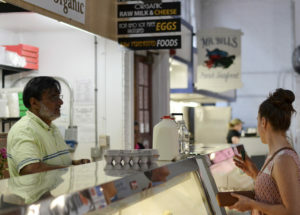 Eating the freshest food possible has long been important to Feizal and his family, so Lancaster County was a natural fit. He’s able to find exactly what he’s looking for just steps from his door, unlike in the 70s when he would drive three-plus-hours to find the closest farm market. Then when he came to Market, he ultimately found another home, of which he said, “To me, Market brings freshness, health, and wellness. Dealing directly with a farm means being able to get the freshest you can out there.” It was here where he was introduced to, and frequented, the specialty dairy at Oasis at Bird-in-Hand, a stand he found exciting as a long-time follower of the organic, grass-fed movement. 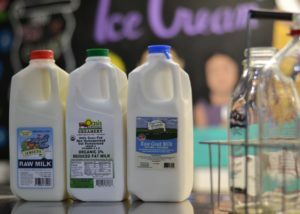 Shortly thereafter, the opportunity arose for him to buy the Market business Oasis started, and he has continued to share their dairy products, along with equally exceptional products from two other dairies, at Pure Palate Organic. Each of the three brands Feizal carries are certified as organic, which refers to pastured cattle grazing a diet of fresh, chemical-free grass or hay. And he proudly proclaimed of the dairies, “We are 365 days on grass. USDA allows you to be 135 days on grass in order to be considered grass-fed, but we are well beyond that.” He offers, as well, both partially pasteurized and raw dairy products, including A2A2 milk, all of which are touted for their natural health benefits. He has found a niche here at Market, and whole-heartedly welcomes the conversation that comes with his relatively unconventional product offering. Thank you, Feizal, for sharing your passion for wellness here with us at Market, and we hope your customers — and all Market friends, too — continue to feel good about what they’re taking with them each visit.